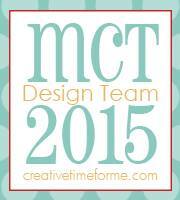 I am so excited because today is Tacky Tuesday's Challenge #3! First off, I wanted to announce the winner of challenge #2. We had 40 super cute and very creative entries this time! Thank you to everyone that played along with us! I used random.org to choose the winner...... and the winner is.... Kimberly Miller Jensen! Congrats Kimberly! Remember that we changed the rules a bit. If you do not have the cart that we pick, you can still play along as long as you use a similar cut, but you will still need to do a play on words somewhere on the front of your card. 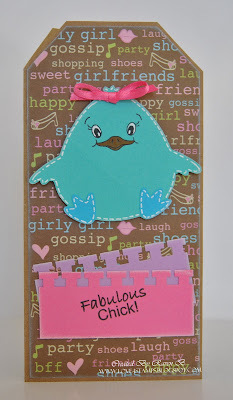 This weeks challenge we are using the Chick from the Simply Charmed cart (Page 35), you will also need to use the word "chick" somewhere in the sentiment on you card/layout. We have a guest designer this week! This is Alex's card! This is the Queen's card! Hop on over to her blog for more info and photos! 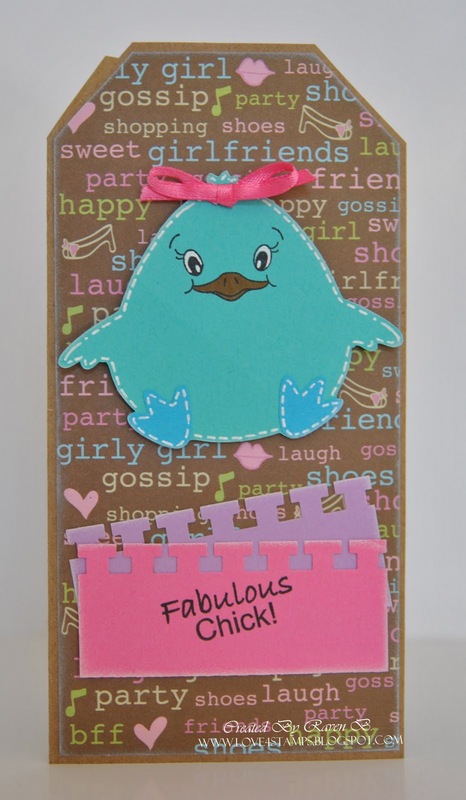 This is my seriously tacky card... in more ways then one. The winner of this challenge will receive a set of PK-451 Wide Eyed Kids 1 1/8". Make sure that you post your card to our Facebook group, Tacky Tuesday's, before March 1st, 2011. 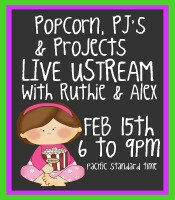 Popcorn, PJ's, and Projects Ustream! We are going to have soooo much fun! I hope you will join us! All the fun starts tonight at 6:00pm (pst), 7:00pm (mst), 8:00pm (cst), and 9:00pm (est).